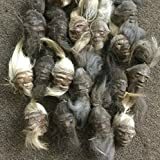 Nothing makes a more unique decorative statement than a Jivaro Tsantsa AKA a shrunken head on full display... just hopefully not yours. Well, now you can have your very own head shrunken down or even anyone else's or that matter, minus the whole annoying death part, with this cool new and slightly disturbing Custom Shrunken Head. Just place your order on Etsy, send in photos of the person's head you need shrunk from the front and side, preferably with the eyes closed, and in about a month it will arrive. 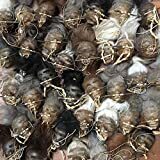 Each highly realistic custom shrunken head is handmade to order to your specifications, like having the mouth and eyelids sewn shut with rope or something, and comes complete with eyelashes, eyebrows, nose hairs, and more. If you won't be shrinking your own head, it also makes the perfect gift for friends, enemies, loved ones, ex-loved ones, annoying neighbors, politicians, or just anyone you want to *ahem* give a little head too. They also make super cool Christmas tree ornaments! Feathers, ropes, spikes? It's up to you.